Removes air and creates an air tight seal that preserves wine after the bottle has been opened. Keeps wine fresh and full-flavored up to 14 days. 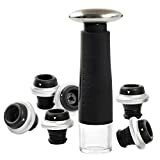 Reusable 1 x wine saver vacuum pump and 6 x silicone bottle stoppers. Enjoy a variety of wines at the same time without worring about the wine deteriorating. Date indicator on the wine stopper helps keep track of wine freshness, so even opened bottles can be saved and enjoyed confidently at your event. Easy to Use: 1. Place the smaller side of the black wine bottle stopper into the bottle mouth, 2. Position the pump on the top of the stopper, 3. Pump the air out until resistance is detected. Your wine is now preserved! Suitable for all standard size bottles of red and white wine, hand wash. Attractive gift box creates an excellent gift for friends, family and all wine lovers. Ketone Keto Urine 150 Test Strips. 3 Resealable Foil Packs of 50 Strips Each. Lose Weight, Look & Feel Fabulous on a Low Carb Ketogenic or HCG Diet. Accurately Measure Your Fat Burning Ketosis Levels.